JDBC (Java Database Connectivity) format provides generic non-spatial access to a wide number of database formats through JDBC drivers - analagous to ODBC connectors. The advantage of the JDBC is that it is available on all platforms supported by FME. Information on how to get started with this format is available in the JDBC format documentation. 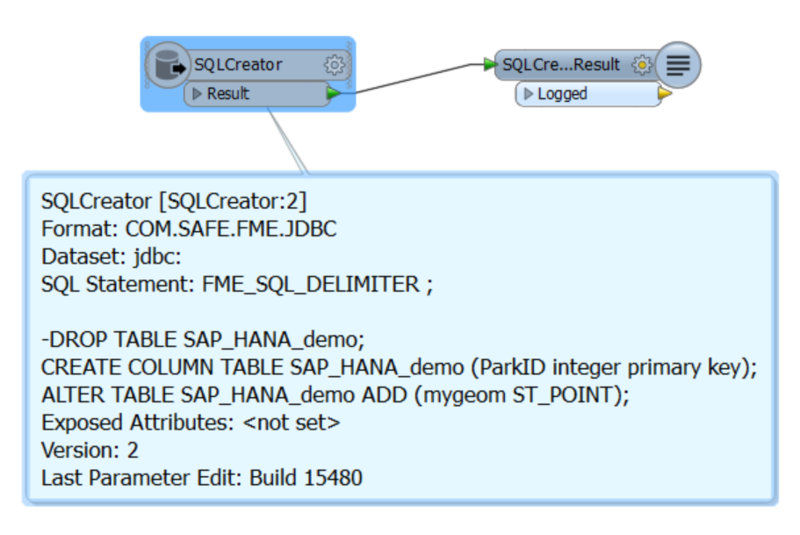 CreateSpatialTable_2015.1.fmw is a simple workspace showing how to create a geometry column in a SAP HANA database. This is simply an example of working with a spatial data column when FME's not able to do it through a dedicated writer. 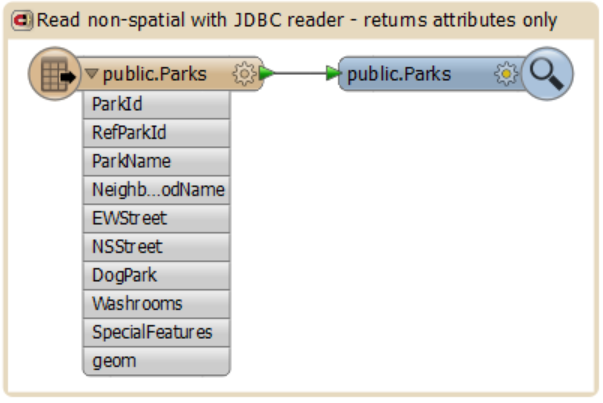 NOTE: FME now has a dedicated SAP HANA Spatial Writer so this approach is no longer necessary for this format, but this example is applicable to other JDBC formats where we don't support the Spatial format natively in FME. ReadJDBC_2015.1.fmw shows how to read non-spatial data from one of our postgresql databases. This is no different than using any of our regular database readers or writers. To get at the Postgis geometry it is necessary to work with the geometry column and the various postgis functions such as ST_AsText() or ST_AsBinary(). The GeometryReplacer can be used to take the WKT or WKB and replace the non-spatial features with a spatial feature. 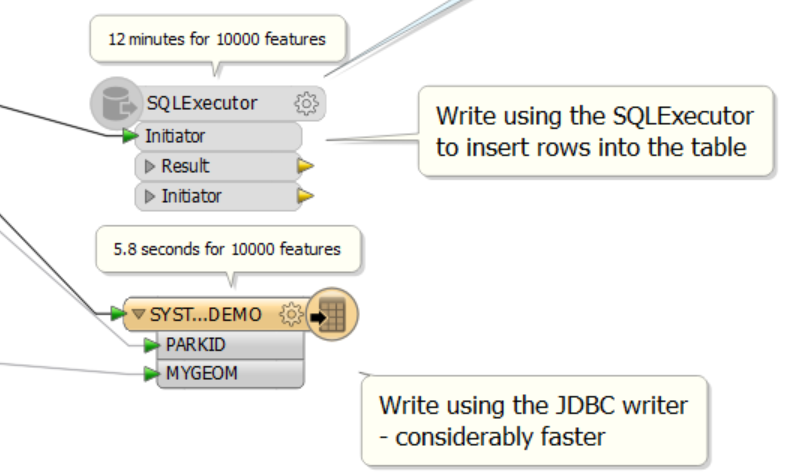 The workspace WriteJDBC_2015.1.fmw shows how to write to a JDBC SAP HANA database in one of two ways. When writing spatial data it is necessary to extract it, using a GeometryExtractor, into Well Known Text or Well Known Binary depending on how the database is expecting to store the geometry. Then it is possible to write via the JDBC writer which allows for easier attribute handling and provides full support for inserting new rows, updating or deleting existing rows. Some formats (see table below) writing via the FME writer is still not supported. So an alternative method is shown using the SQLExecutor to Insert records. This has shown to be considerably slower but is all that it available for some databases. The following formats were previously availabe via the JDBC Reader/Writer and mentioned in the 'well supported' table below. They are now fully supported Readers/Writers and have been added here for continunity and links to the FME's official documentations. *Azure Spatial Writing performance may be slow. Please contact Safe Software support if you are experiencing performance challenges when writing to Azure Spatial database with FME.